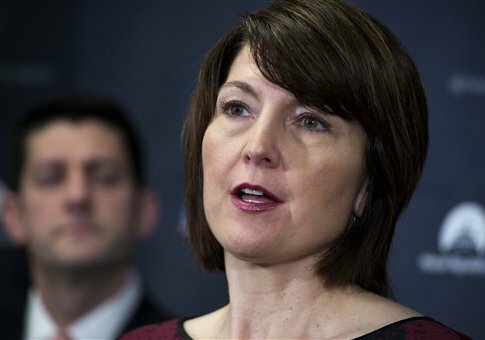 Rep. Cathy McMorris Rodgers (R., Wash.) will introduce legislation Monday that would gradually cut funding for unauthorized government programs in order to compel Congress to take action on them. The legislation would pressure Congress to reexamine government programs whose authorizations have expired by subjecting such programs to a rolling sequester, which would take place over three years and end with a complete elimination of funding if lawmakers have not acted to reauthorize the program. Currently, the federal government funds 256 unauthorized programs costing $310.4 billion, including entire agencies such as the State Department, according to the Congressional Budget Office. The bill, called the Unauthorized Spending Accountability Act, is backed by more than a dozen organizations that agree it would boost oversight and rein in unnecessary government spending. McMorris Rodgers, who chairs the House Republican conference, told the Washington Free Beacon in an interview that the bill would ease Americans’ frustrations about rampant government spending by ensuring that their elected representatives are scrutinizing the agencies and programs funded by their tax dollars. "This is all part of restoring our power of the purse, our constitutional role, and ensuring the accountability to the people," McMorris Rodgers said. "What we’ve seen from a lot of these agencies is that they become arrogant, they become disconnected from their mission, and this restores the accountability with the elected representatives," McMorris Rodgers stated. "[The bill] allows us to review, first of all, whether or not this program, this agency is fulfilling the law, whether or not it is meeting the mission that is outlined in the law. And then, it also allows us to take action if the law needs to be changed or updated or if the agency has gone beyond what was ever intended or has exceeded its authority." Under the bill, programs that have expired authorizations—which McMorris Rodgers calls "zombies"—would be subject to a 10 percent spending cut in the first year of unauthorized status and a 15 percent cut in the second and third years. If Congress fails to reauthorize a program after three years, it would be sunsetted—meaning funding would completely disappear—at the end of the third fiscal year. Thirteen organizations, led by the National Taxpayers Union, sent a letter to McMorris Rodgers Monday expressing support for the legislation. "These programs are funded each year without sufficient oversight and accountability. The USA Act would provide an incentive for committees to take charge of the expenditures within their jurisdiction by subjecting unauthorized programs to automatic spending reductions," the letter read. "We commend you on your thoughtful approach to increasing accountability, which will result in reducing unnecessary federal spending." While the bill would not guarantee that overall federal spending would be reduced, it could result in Congress deciding to cut or adjust funds to programs that haven’t been examined in years, according to the president of Citizens Against Government Waste, one of the groups supporting the bill. "If Congress isn’t taking the time to examine the program, maybe it’s not something they should be spending money on," Tom Schatz, the organization’s president, told the Free Beacon. He also emphasized that the bill would force agencies to "re-justify" themselves after a period of time. In addition to establishing the sunset process for unauthorized discretionary programs and agencies, the bill would also create a Spending Accountability Commission to oversee the authorization schedule and review all mandatory spending programs. The commission would also be able to propose mandatory spending reductions in the event that an unauthorized program’s sequester needs to be overridden. McMorris Rodgers said she is "encouraged" by the support she has received for the bill, adding that she has engaged in conversations with some senators about introducing companion legislation in the Senate. When asked about any fellow Republicans or Democrats who have signed on to back the bill, McMorris Rodgers indicated that she has "some commitments" that would be released this week along with the legislation. Schatz called the support for the bill "widespread." He said that talks have occurred for years about a sunset process for unauthorized government programs, though no legislation has ever been successful. Chrissy Harbin of Americans for Prosperity, another organization backing the legislation that sent its own letter of support to McMorris Rodgers, said the USA Act represents a rare instance of a lawmaker taking action to increase oversight of federal spending. "We hear consistent calls to rein in spending from candidates running for office, but rarely are these words put into action once they get into office, Harbin said. "Getting at the heart of the problem of unauthorized appropriations will bring much-needed accountability to federal spending, the kind that American taxpayers deserve." This entry was posted in Issues and tagged Cathy McMorris Rodgers. Bookmark the permalink.